Due to the large number of requests we get about making jerky, we are going to skip the usual turkey recipes and talk about this getting-back-to-basics food. Jerky is simply meat with all the moisture removed. It's one of the oldest known forms of preserving food. As long as it's kept dry, jerky has a shelf life longer than a loaf of white bread with preservatives. No self-respecting cowboy or Texas Ranger (not the baseball kind) would be caught hungry as long as he had a few sticks of jerky in his saddlebags. Prehistoric man made jerky from buffalo, antelope, deer, elk or whatever else he could bring down. As long as the meat is lean, it will turn into jerky when properly treated. Fatty meat won't make jerky, as the fat will go rancid quickly. Prehistoric jerky was either sun-dried or hung down-wind from the campfire. The smoke kept the flies off it and imparted a good taste. Today jerky has become very popular. Nearly every convenience store you go in has a box of jerky on the counter near the cash register. Here in Texas when the weather is nice, you can find little tents set up alongside well-traveled roads advertising "Jerky -- Free Samples." It's some sort of franchise operation. The Wapiti Ranch down the road from me had signs up a year or so ago advertising elk jerky. Store-bought jerky is expensive, the reason being that meat is two-thirds moisture. When you remove the moisture, the meat weighs a lot less. If you start with three pounds of meat, the best you can expect is one pound of jerky. So, if you and your family like jerky, make it at home and save some bucks. 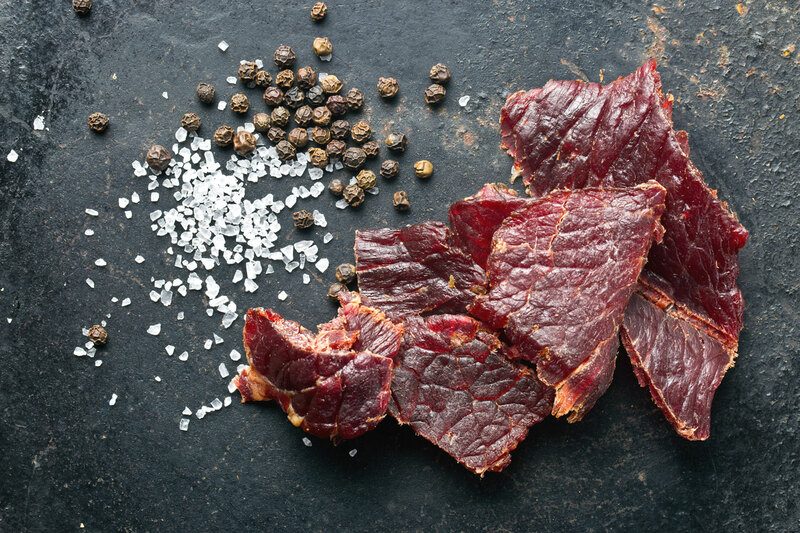 Making jerky at home is fairly simple. There are a few rules you have to follow. First of all, you need lean meat. As we said earlier, fat goes rancid in a hurry. Meat of choice is beef, round steak or flank steak. You can use venison, buffalo, antelope, elk, and there are a few who believe in turkey jerky. when you bend it, it will crack but not break. A food dehydrator makes good jerky. If you don't have one, you can use your oven or meat smoker. The sun drying process will probably take too long for most folks to want to try it. The meat is cut into strips no more than a quarter inch thick by about a half or three-quarters inch wide and six or eight inches long. Cut the meat across the grain like you were slicing a brisket. If the meat is frozen to the point where it just has ice crystals in it, it's a lot easier to slice. You can either freeze it or thaw it to that point. Use a sharp knife. Remove all fat and white tissue. Pioneer jerky was seasoned with just salt and black pepper, and then dried. Today there are two methods for seasoning the jerky -- the quick-cook method and the marinade method. We prefer the quick-cook method as it gets rid of a lot of little bugs that may be lurking in the meat. Bring a large pot of water to a rolling boil. Drop the jerky in for a minute or two until it turns white. Dry it with paper towels, season with dry seasonings and then dry it. Mix it all in a large pot and bring to rolling boil. Don't overload the pot. Make two or three batches if needed. Leave the meat in until about one minute after the rolling boil returns. Pat dry and take to your dryer. Mix all and put in Zip-Lock bag with meat. Massage to get meat well coated. Refrigerate overnight. Pat dry and put in dryer. As with any of my recipes, the above is not written in stone. I urge my readers to experiment to find the flavors that are perfect for them. I would like a decent amount of cayenne and some onion powder in my seasonings. You might want to try a little chili powder for a Southwestern flavor. However, don't leave out the salt, it helps draw the moisture out of the meat. If you are of pioneer spirit and want to try sun drying the jerky, you will need to find something to hang it on where the pieces of meat do not touch. You put a little cotton string in the top of each piece to hang it by. The meat goes into a location where it will get sun all day. You will need to cover it with cheesecloth to keep the bugs off. It will take several days to dry. You have to bring it in at night to keep the morning dew off. Jerky is "done" when it has turned nearly black and, when you bend it, it will crack but not break. The good food dehydrators will come with instructions for making jerky. Follow those directions, as they will vary from machine to machine. Easiest way is to dry the jerky in your oven. You will need a wire rack or something like that for the jerky to rest on. You want a cookie sheet in the bottom of your oven to catch the drippings. Set the oven at 140 degrees and leave the door partially open. It will take six to eight hours to cure the jerky. If you have a smoker, I think that would be the best since it will give you some great smoke flavor. You will need only a small amount of coals for the drying. If you use charcoal, about six or eight bricks should do. If you are using coals, about a handful of them. You are not cooking the jerky, so keep the temperature down to about 140 degrees. This method will take about six or eight hours. You will probably have to add some coals or charcoal as you go. I can't find anyone who makes jerky in a microwave. I think the meat would cook rather than dehydrate in the zapper. When your jerky is done, let it cool completely. Then put it in zip-lock bags or air tight jars. It will keep better in the icebox, and it can be frozen. I've found that if you zap frozen jerky in the microwave about thirty seconds, it will thaw and get tender. There you are boys and girls. Whip up a batch of jerky to give your friends and relatives for Christmas. They will think you are so neat.